At the press conference, advocates painted a bold vision for Illinois: solar panels on every roof, electric vehicle chargers in every garage, and a committment to completely renewable energy by 2050. Illinois is the 4th leading state in the country for coal production, according to the U.S. Energy Information Administration. In fact, just five states -- Wyoming, West Virginia, Pennsylvania, Illinois and Kentucky -- make up 71% of the country's coal production. While the industry only makes up a small percentage of jobs in the state, thousands could be affected here in Illinois. Pritzker said, though, that the country has already moved away from coal and many communities have already been negatively impacted. He said shifting to green technology is a chance to create jobs and stimulate the economy. 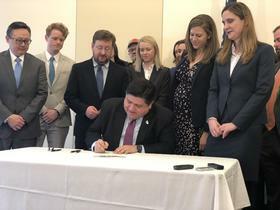 "When you talk about justice, environmental justice, you have to be talking about the change that's occured already over decades for families who've been depended on coal-fired plants and on the mining of coal," said Pritzker. "The jobs that get created, we need to be focused on those communities that are most affected by climate change." Jen Walling, the executive director for the Illinois Environmental Council, said there are already "over 120,000 clean energy jobs" in Illinois and that sector continues to grow. She spoke about the urgency to address climate change and why Illinois moved the needle in the right direction. "The intergovernmental panel on climate change has found that we have just 12 years to limit carbon emmissons in order to keep climate change at moderate levels," said Walling. "This will require slashing greenhouse gas emissions throughout the world." Jack Darin of the Illinois chapter of the Sierra Club criticized President Trump's decision to pull the U.S. from the Paris agreement. He said while the decision could not stop the world from shifting toward clean energy, the country could miss out on the "economic potential." "He can tell the world to pass us by and leave our communities and our workers of the benefits that are rapidly growing across the rest of the world and that's why leadership from states is so important," Darin said. The U.S. Climate Alliance is a bipartisan group of governors across the country that aims to reduce greenhouse gas emissions by 26-28% by 2025, from the levels in 2005.